A resume is the most important document when attempting to secure a work position. As job seekers will often tell you, work experience is the most important factor when attempting to land a job. However, when you are going for your first job right out of school, they can’t possibly penalize you for not having experience, right?! Wrong! Even at your first job employers these days expect you to have experience; if you don’t, you will often be passed over for someone who does. In these instances, it is great to have an internship under your belt. So, what do you need to obtain an internship? A resume, of course. However, the resume for an internship differs from a resume for a job; mainly, because a job resume focuses on work experience, whereas an internship resume does not have that facility. So, it must instead focus on you and your education. It must highlight your strengths and make the organization believe that they will benefit from your skills and experience. This of course raises the question, how do I do that? Format: First and foremost, use a professional layout and font. The page should be white, A4 size with one inch margins. The font should usually be 12 pt Times New Roman, or Arial, never Comic Sans. You can use a 14 or 16 pt font for headings. Personal Details: Always list your name, address phone number and e-mail address at the top of the page, in the form of a letterhead. If you are applying for an internship in the design industry, you can even design an attractive logo or letterhead, to showcase your skills. Objective: Then write your objective, which is essentially what type of internship you are looking for and what you hope to achieve in that internship. 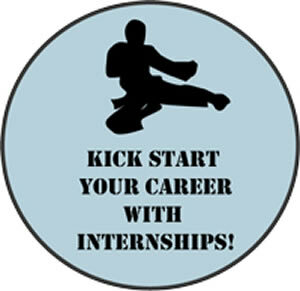 For example: To gain an internship in the design industry in order to learn on-the-job skills and gain experience. Profile: This should be followed by your profile, which should summarize your selling points. This is where you have to show them why they should pick you. Highlight your key strengths and skills; mention what you are studying, and your field of interest and career ambitions. Education: In reverse chronological order, detail your academic experience. Include what degree you are studying for, at what college, its location and the degree’s expected date of completion. Mention any relevant clubs you are part of or any achievements or awards you have earned. You can even mention relevant subjects and the grades achieved. You can also mention your high school, its location and any relevant clubs or achievements. Work Experience: If you have any work experience, mention it here. This can include the babysitting you did, or any summer jobs you may have had. It can even include any volunteer work or community service you did in the past. However, only mention these if they are applicable to the internship. Do not include each and every job you have ever had. Skills: Mention any and all skills you have that will be relevant to the internship, such as knowledge and experience of Information Technology (IT), computing, foreign language ability, any awards or outstanding achievements, etc. Interests and Hobbies: Here you can mention any and all interest and hobbies that are relevant to the internship. Keep it Simple: Keep the entire resume short and simple. Remember less is more; hence don’t do overboard with the information, after all you want to save something for the interview. Include only the most relevant information and in a concise format. Your resume should not be more than two pages long. Honesty and integrity: Always be honest in the resume. Do not lie and do not include vague, general statements; always be specific. Avoid blocks of text: Always include the relevant information in small bulleted phrases and sentences. Avoid using paragraphs as they tend to put all the information in huge blocks of text. Most employers do not have to read the paragraphs; hence they often get skipped, which may cost you the internship. Proofread your resume: Always ensure that the grammar and spellings in the resume are accurate. Nothing is more off putting than incorrect grammar, which often looks unprofessional.